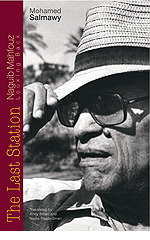 The Last Station Naguib Mahfouz Looking Back "Hard Cover"
In July 2006, at the age of 94, Naguib Mahfouz, the grand old man of Egyptian novels and winner of the Nobel prize for literature in 1988, was admitted to hospital after an apparently minor fall sustained in his home in Cairo. Among the few friends allowed regular visits to Mahfouz’s hospital bedside was the writer Mohamed Salmawy, former colleague at Al-Ahram newspaper and, following the failed assassination attempt in 1994 when Mahfouz had lost the full use of his right hand, an assistant in recording Mahfouz’s late creative output. The Last Station, Mohamed Salmawy’s intimate journal of Naguib Mahfouz’s final weeks, sparkles with reminiscences of joyful times together and significant events from the great writer’s life. Even for those less familiar with the writings of Naguib Mahfouz, it portrays the closeness of two writers from different generations and celebrates the life of an incomparable artist.